2005, 8", Blond mohair Muffy wearing her purple velvet soiree dress with white collar and cuffs,a plaid hair bow, white pantaloons with lace trim and and her purple Mary Jane shoes. 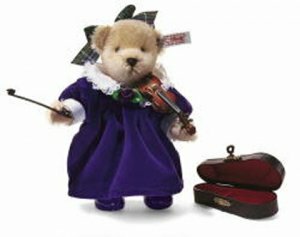 Muffy is playing her own Stradibearius violin which comes with it's own velvet lined case. Fully jointed.